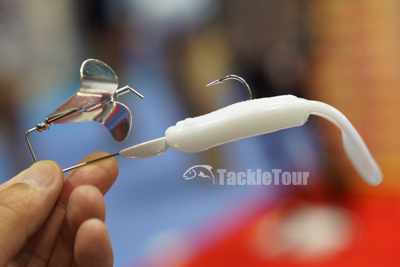 Introduction: Not normally a manufacturer bent on making a big splash during ICAST, choosing instead to ease out new product launches one by one, Big Bite Baits changed course this year with a few new baits and a little refinement in the way their products are presented. The Suicide Buzz will come pre-rigged with a Suicide Shad. 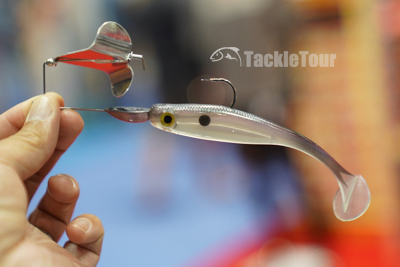 Suicide Buzz: Extending the utility of their popular Suicide Shad, Big Bite Baits is introducing a buzzbait head with a keel shaped head for easy planing, custom painted head and colored blades to compliment your favorite Suicide Shad color. These new buzz-heads will offered in five different colors and two sizes (1/4oz & 3/8oz) pre-rigged with a matching Suicide Shad and will retail for $6.99 a piece. The heads feature a true swimming, keel shape. 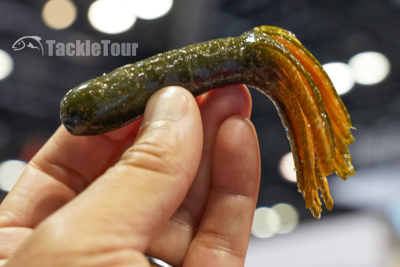 The Tour Toad is a new bait for Big Bite Baits. 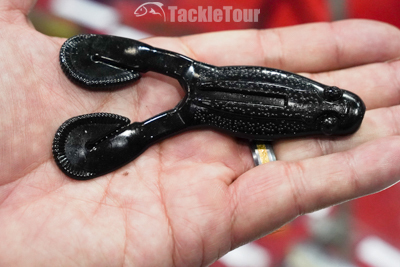 Tour Toad: The Tour Toad is also new for Big Bite Bait this year and features the typical twin buzzing legs. The difference with the Tour Toad is these legs can be split open to present a pair of curly legs for a more subtle swimming presentation. This bait can also be fished on the Suicide Buzz for a really enticing buzzbait presentation. The Tour Toad measures 4 inches in length, features a flat body and is offered in 10 colors at $4.49 per pack of five baits. The legs can be split creating a longer, more curly tail type of leg. The Tour Toad will also be sold pre-rigged on the buzz head and sold as the Tour Buzz in four colors for $6.99. The B5 Line Thru Swimbait is hand painted and will sell for $6.99 per bait. 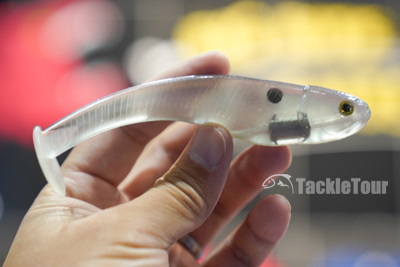 B5 Line Thru Swimbait: Taking things up a notch with their paddletail offerings, Big Bite Baits enters the line through market with their new B5 Line Thru Swimbait. This five inch bait comes with a #4 round bend treble for easy rigging, but you can easily substitute with your own should you choose. 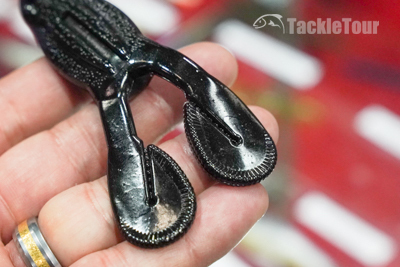 It is designed to swim with an injured baitfish roll as well as the side to side natural tail action. 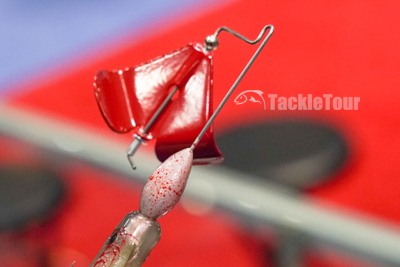 Each bait is hand painted for a total of seven color options including a clear version you can paint yourself! The B5 Line Thru Swimbait is sold in singles for $6.99 per bait. Also available in clear so you can paint them yourself. The Tour Flipper Tube, is a fat, 4 inches in length. Tour Flipper Tube: The Tour Flipper Tube is a fat, 4 inch tube made with super soft plastic, 3x heavy salt, and natural, rough texture. The skirts feature laminated colors for added flash and fish attracting action. It will be offered in 10 colors and sell for $4.49 per pack of eight baits. It comes with a laminate color skirt. The Super Stick will be available with our without an O-ring. 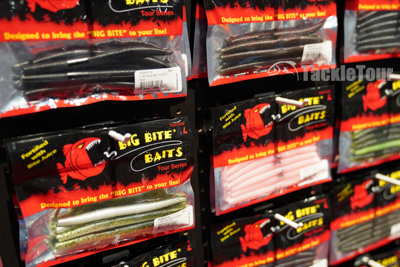 Big Bite Black Label: Big Bite Baits, on occasion, offers versions of their baits with refinements over the standard product. This includes baits like their soft plastic stick bait. 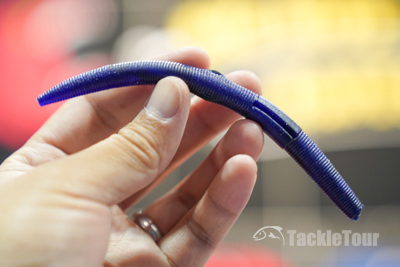 They offer the standard and a version with a built in O-ring for easy wacky rigging. This trend will of course continue but now under a new packaging code. These refined variants will now be sold under a black label package to help consumers distinguish between standard baits and versions with performance enhancing tweaks. 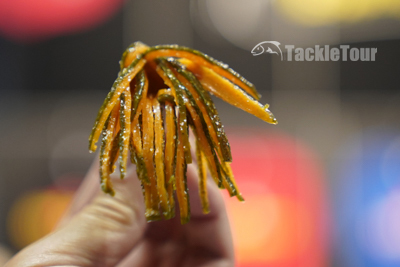 The O-ring version will be sold in the company's new black label - the new way in which Big Bite Baits will communicate bait offerings with a bit more refinement and fish catching enhancements. Big Bite Baits is now making terminal tackle as well like this new screw-in Neko Weight (1/32, 1/16/ 1/8 oz sizes for $2.99 per pack - qty varies with size). Dean Rojas showing us what's new with Big Bite Baits. 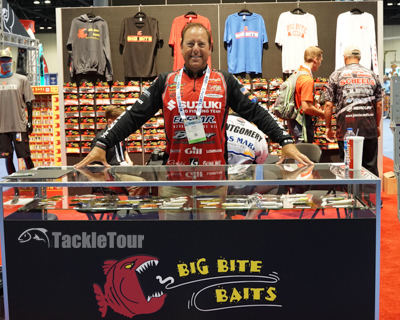 We can't help but feel Big Bite Baits has even larger plans in store for the coming years as they refine both their baits and overall market impressions. 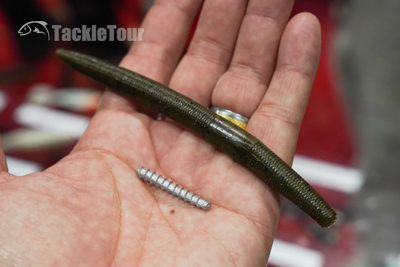 The company also has a new line of terminal tackle that include screw in (instead of push in) Neko Weights, and a new double wire keeper swimbait head in sizes from 1/8 oz through one full ounce. They are primed to take a you know what out of the competition.